Every day on the Green Line, hundreds of light rail trains open their doors to let passengers board and many folks board through the back. In many other countries, this isn't so much a problem since fare collection usually happens on the platform. Here in Boston, fare evasion is a way of life because not all platforms have fare validation machines and the ones that do barely make clear what they're for. Gator board signage has shown up at many stations with instructions on how to validate and why. They are very text-heavy and in the same style as the press release-style, copy-pasta signage that I first sought to correct and eliminate three years ago when I first started this blog. Taking Resevoir as an example of this failure to bring attention to instructional signage and design that signage well, we see that the sign doesn't stand out at all as you come down the stairs onto the platform. If you're coming from the other side of the booths, you won't even notice a sign because there isn't one. As riders come closer to the sign, it becomes apparent that the sign is a wall of text. If you actually read it, you learn the MBTA calls these booths 'Fare Array Huts'. 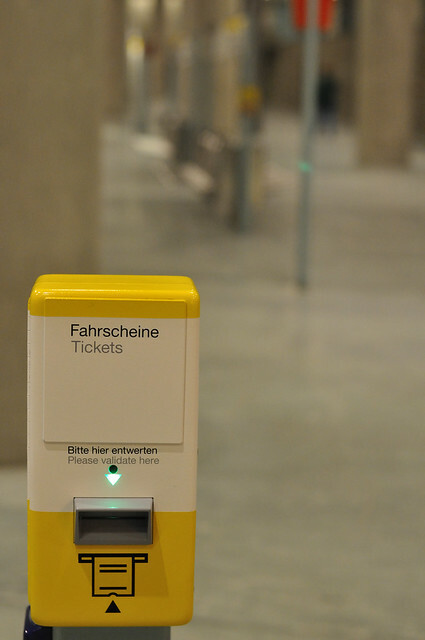 Otherwise, there is no clear warning about the penalty for fare evasion, which may as well be a good thing since there seems to be hardly a soul who gets ticketed and the so-called 'Inspectors' don't make frequent inspections; it is almost an empty threat to warn of a fare inspection and penalty with no proper process to enforce it. Once you get to the doors of the booth, there is even less of an indication of what these machines do. When you actually get into the booth and get in front of the machines, it's not very clear what 'Ticket/Card Validation' is and beyond the fact that it will 'deduct fare' there is not clear indication of what this machine will do. Why would anyone with a CharlieCard smart card, loaded with monthly pass and/or cash fare, tap in order to receive a paper CharlieTicket? This is especially confounding for or unclear to people unfamiliar with the proof-of-payment method of fare collection, which is a massive swath of Americans who either don't have access to transit or are used to metro (fare gates), bus (on-board payment at farebox), or commuter rail style (ticket and conductor) fare collection. Only after you tap do you get instructions on-screen to hold onto the ticket in the (unlikely) event of a fare inspection and that the ticket is your proof of payment. Standing next to the larger machines, the similar physical vocabulary and shape of the devices is plain and homogenous. Compare and contrast this with New York City MTA's full-size cash-accepting ticket vending machine (TVM) and the card-only TVM (below). 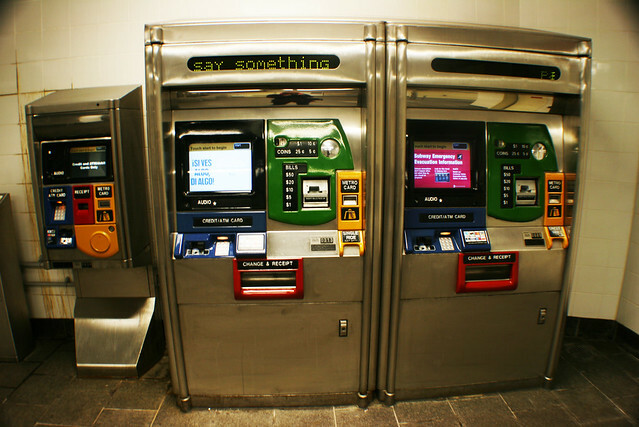 To people from other systems with two different types of fare vending machines, or even people for whom the T is their home system, the smaller ticket validator machines look outwardly like mini-TVMs. I know when I first visited Boston, I myself was confused about the devices and actually tried to add fare on my CharlieCard with one. As high a literacy rate as we may have in this country, we are all still bound by the very basic principle that we are humans who live in a complex world and are bound by the process by which our brains filter and perceive the most pertinent information; in short, we will see the physical shape and design language of the machines before we ever stop to read about them. In many other systems across the world, ticket validation and strict policing of fare collection with fines and even criminal charges is a way of life. These machines require little to no branding, but are clear in their purpose in the context of a society where proof-of-payment transport systems are a way of life and in the simplicity of their design. With all of this said, is it worth it for the MBTA to take a more proactive and less reactive approach to all-doors-boarding, fare collection, ticket validation, and fare evasion? Absolutely. Is it a priority? Definitely not. Remember in my previous post that the cost of fare evasion to an agency is not only nearly negligible compared to total revenue collected, it is next to impossible to estimate and is a loss that, if recovered, would not be nearly enough to begin closing the growing operating budget gap caused by much more serious funding issues above the MBTA and outside of its control. Legislation will soon be introduced by Secretary of Transportation Davey that will hopefully address the real need for more strict penalties for fare evaders and give Inspectors and plainclothes transit PD the real power to hold accountable those who are effectively stealing a public service by evading fare collection. Of course, there are many other times people get on without paying, including those times that drivers wave people on, whether because they need to keep to schedule or a rider has large bills and cannot reload fare at the fare box. There is also an alarming regularity with which doors are simply left open for riders to get on at terminals before the train and fare box are programmed for fare collection. These are policy issues that need to come down from the top with better management of lower-level employees. The real problem is at the State House, where legislators hold the power to properly budget for necessary transport services and infrastructure, which they have not done for many, many years, despite earnest attempts to do so.